CAROLINA, Puerto Rico  In his heyday he was known as Juan Gone, a fearsome slugger who could make baseballs disappear and runners score with uncommon frequency. Now for stateside fans the play on Juan Gonzalez's name is more like: Where has Juan Gone? Once apparently headed to the Hall of Fame, Gonzalez is striving to put his career back on track after having only one major league at-bat in the last two seasons. The latest stage in his attempted comeback has been the Caribbean Series, where Gonzalez entered Wednesday's finale with nine hits in 22 at-bats (.409 average) for the Puerto Rican team in front of close to 20 scouts. The yearly event pitting the winners of four winter leagues — which the Dominican Republic claimed by winning its first six games, rendering Wednesday's finale meaningless — provided Gonzalez a chance to showcase his trim, fit body, free of the injuries that have dogged him in his career, especially since 2002. Whether that's enough to tempt a team to take a chance on one of the most productive sluggers of the 1990s remains an open question. "He looks like he's in good condition, the actual bat speed is quick, and he looks motivated," said Billy Owens, the Oakland Athletics director of player personnel, who was scouting the Series. "But it's a gamble because of the history of him not playing." Gonzalez, 37, said four or five teams he won't name have expressed interest, but already several possible suitors, such as the Los Angeles Angels, Detroit Tigers and Baltimore Orioles, have said they'll pass. That leaves Gonzalez searching for a return ticket that will allow him to continue his pursuit of 500 career home runs — he has 434 — and an increasingly elusive spot in Cooperstown. "That's still my goal, and I remain confident I will attain it," Gonzalez said. "The most important thing is to stay confident so I can achieve my goals. I've worked hard, watched my weight and improved my diet, done a lot of work off the field." But he hasn't been on a major league field since May 31, 2005, when he tore a hamstring in his first at-bat of the season with the Cleveland Indians and sat out the rest of year. Last spring, Gonzalez backed out of a minor league deal with the Boston Red Sox after they traded for outfielder Wily Mo Pena, and he played 36 games with the Long Island Ducks of the independent Atlantic League. 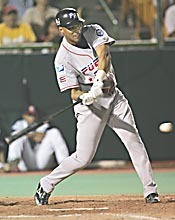 Then he played winter ball for the first time in a decade with the Gigantes de Carolina, hitting .281 in the regular season before hitting .369 in the playoffs. Altogether, Gonzalez had seven home runs and 23 RBI in 45 games. Asked about the modest power numbers for a player who averaged more than 43 home runs in the majors from 1996-99, Gonzalez points to the large dimensions of Roberto Clemente Walker Stadium, where he played his home games as a designated hitter, and to pitchers' reluctance to challenge him. Gonzalez looks slimmer than he did in his most productive days, which he attributes to a vegetarian diet and to switching from a weightlifting-intensive regimen to working out with elastic bands for better flexibility. Gonzalez was accused of using steroids by former Texas Rangers teammate Jose Canseco, who said in his book, Juiced, that he injected Gonzalez directly. Gonzalez denies the charges and says he doesn't believe being linked to steroids has scared away teams. "I don't think so because I never tested positive," Gonzalez said. "I've always said whenever they want to test me, they can. I've never tested positive or used any of those things." Gonzalez acknowledges he likes to have a group of friends accompany him during the season, and the entourage has raised the hackles of some team officials. Still, Indians general manager Mark Shapiro said his dealings with Gonzalez were "extremely positive. He's a passionate guy who cares deeply, he works hard and he's a very sincere person." Gonzalez sounds honest when he says he doesn't regret turning down the Tigers' offer of an eight-year, $140 million contract in 2000. Gonzalez was 30 at the time, only two years removed from his second MVP season. His 1,068 RBI in the 1990s tied for the fourth most in that decade in the majors. After a turbulent season in Detroit in which he missed 47 games, Gonzalez bounced back with a huge 2001, helping the Cleveland Indians win the AL Central title by hitting 35 home runs and driving in 140 runs. He hasn't played more than 82 games since, as hamstring, hand, shoulder and back injuries have kept him mostly off the field, prompting the perception he has lost his desire for the game. "I think he might have forgotten about the days when he was a 17-year-old, with that passion and that hunger," says former major league shortstop Ivan De Jesus, who recently joined manager Lou Piniella's staff with the Chicago Cubs. "He needs to show he still has that passion." Gonzalez argues that his passion is proved by his willingness to continue working despite having made enough money in his career — close to $90 million — to retire comfortably. The thrice-divorced Gonzalez says his once-tumultuous personal life is in order, and that he has found peace. "I'd rather have health and my family, my relationship with God than money," he said. "How many people who can buy whatever they want have committed suicide? God is first, then your kids, your family, good health." If nothing else, he finally has the latter.